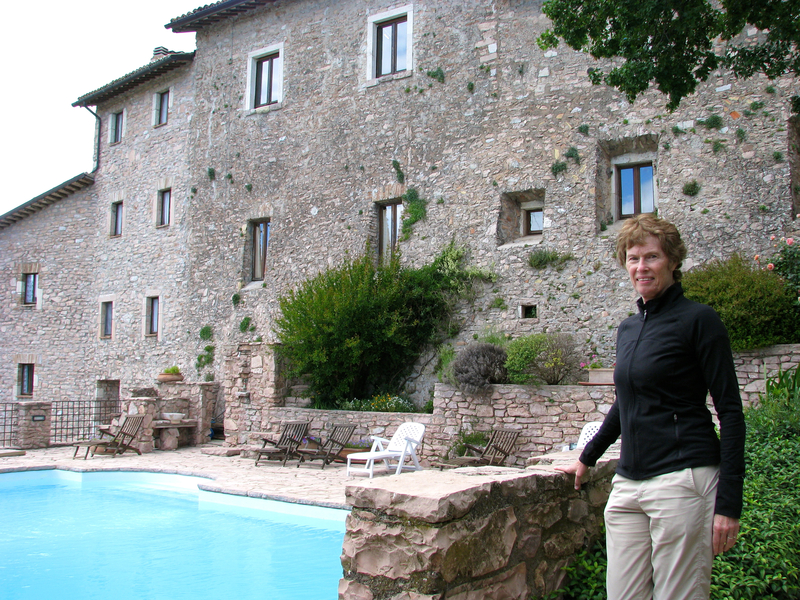 To get you in the mood, here is a brief slideshow on our place in Umbria. For our Big Night we decided to do Veal Saltimboca with Eggplant Parmesan, Arugula and Cantelope salad and Zabaglione over Poached Fruit. 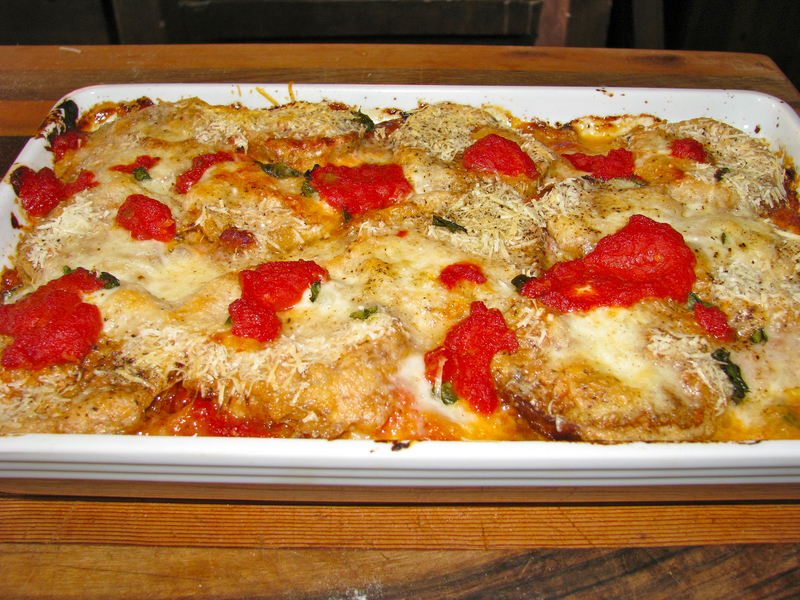 The Eggplant Parmesan is already on our website – make sure you click the link and make one this summer. 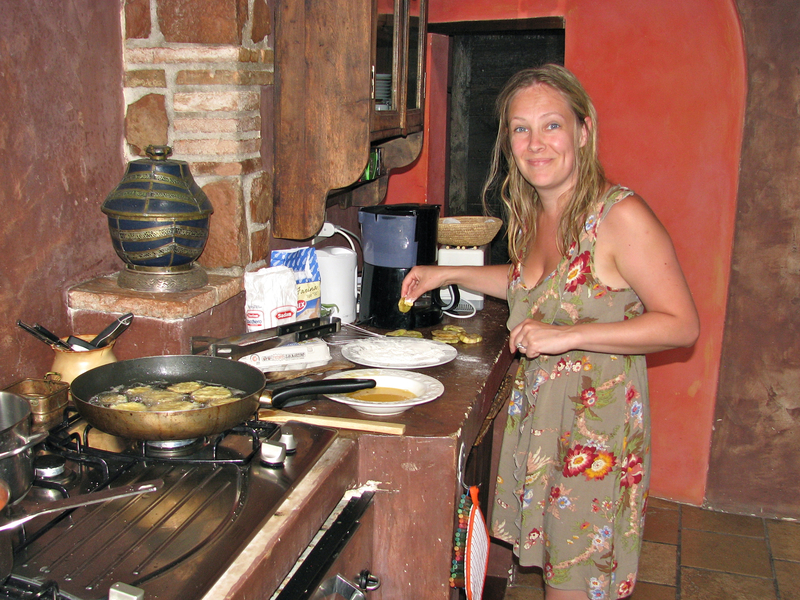 In Umbria we had a new Bravado chef help with the dish. We used real buffalo mozzarella and some exquisite eggplants that had been recently picked. The result was wonderful. This dish is very simple and really tasty – and, don’t forget that arugula is a proven aphrodisiac, which possibly accounts for strong Italian libidos since they seem to eat arugula with every meal. 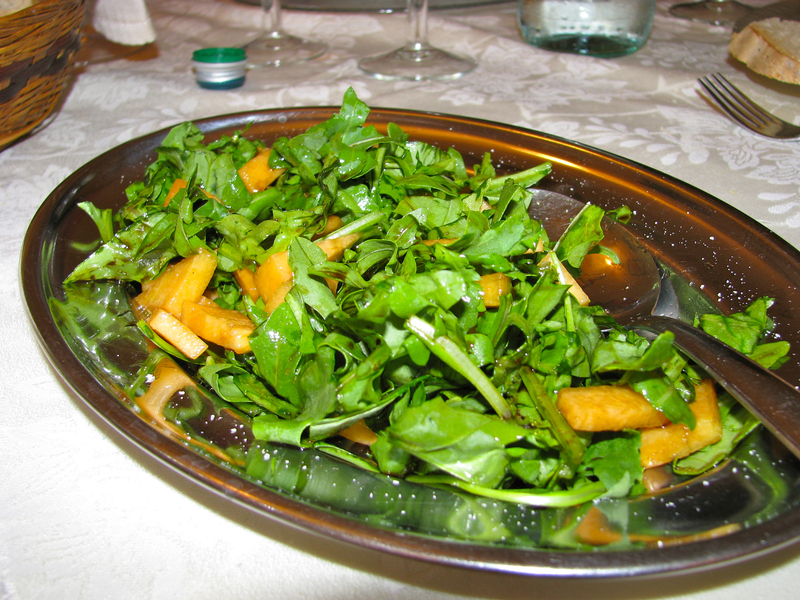 The salad has four ingredients – arugula, finely chopped ripe cantelope, olive oil and balsamic vinegar. Try it and you will love it. The main dish, was prepared by Stewart, our host. He claims this as one of his signature dishes. 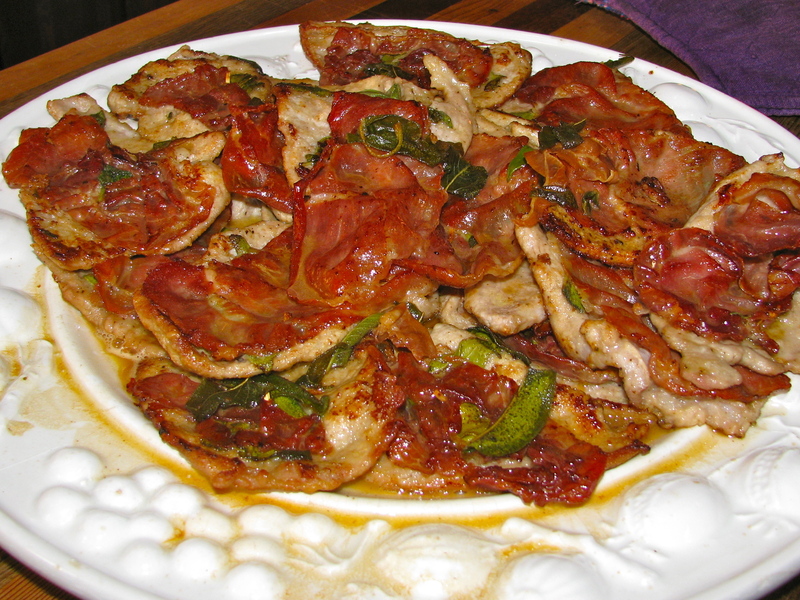 It is an obvious choice in Italy and especially in Umbria where veal is plentiful. I actually think the Italians invented veal. If you think about it, in addition to veal saltimboca, there’s veal scallopini, veal picatta, veal Milanese, veal Bolognese, etc. We found veal in every restaurant in Italy. 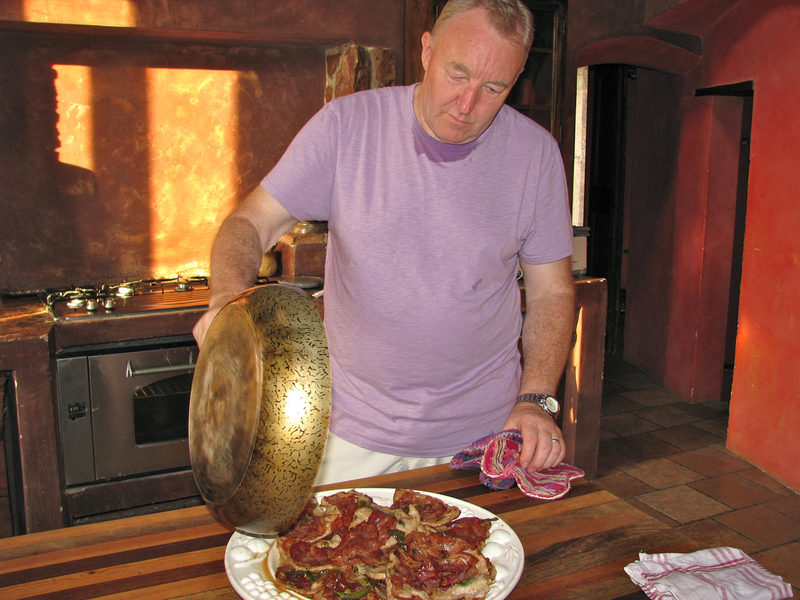 Pound the scallops as thinly as possible with a standard kitchen meat pounder. You can use the corrugated side and don’t be afraid to whack away. Cut some of the larger scallops in half. Mix the flour and salt and place in a shallow plate. Dredge the scallops in the flour and salt, shake off excess and lay out on a large cutting board. 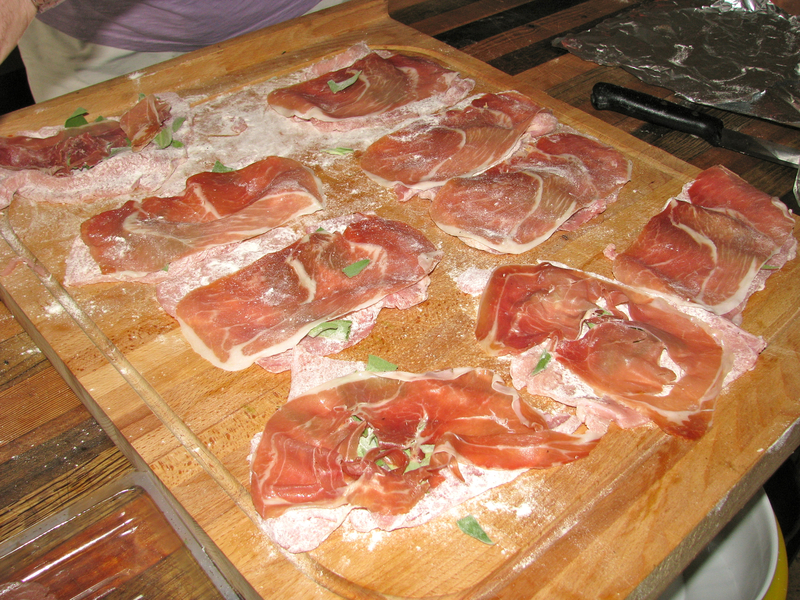 Put two or three sage leaves on each scallop and cover with a slice of proscuitto. Use a toothpick to attach the proscuitto to the scallop, sandwiching the sage leaves inside. Heat the oil and 4 tbsp. of butter over medium high heat. Add 4-5 sage leaves to the oil/butter mixture. In batches, cook the assembled scallops starting with scallop side down. Turn over after about one minute and cook for another minute until the proscuitto starts to become crispy. Put cooked scallops on a baking pan, proscuitto side up, and keep warm in the oven while you continue with the other scallops. When finished cooking the scallops, deglaze the pan with the Marsala wine and let it reduce to about half. Add the last tbsp. of butter and stir well. Arrange the scallops on a serving platter and pour the sauce over the top. Serve immediately. Zabalione is a simple sauce made with a double boiler. We had to improvise, but it worked fine. Put the fruit and wine in a saucepan with the Marsala wine and gently simmer for 20 minutes. Put about one quart of water in the bottom of the double boiler and turn to medium high heat. 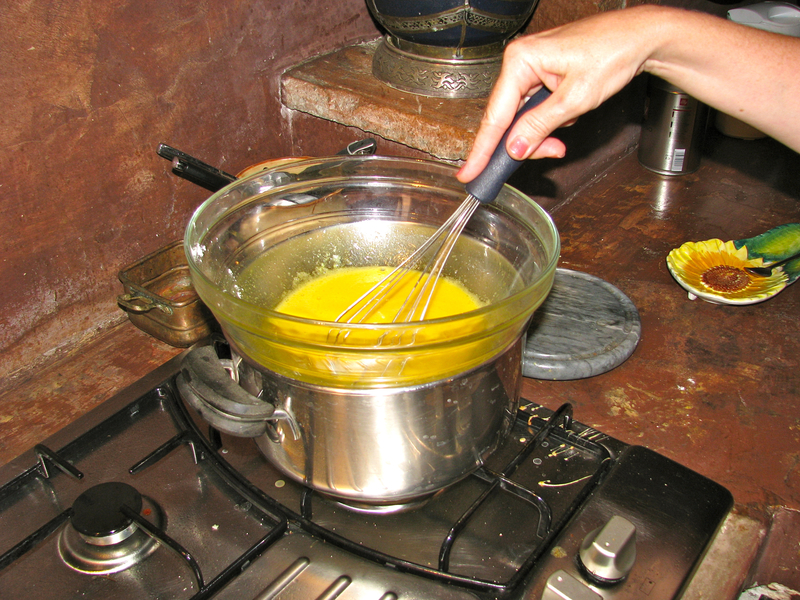 Whisk together the eggs, sugar and wine and pour into the top part of the double boiler. Cook, stirring constantly, until the mixture thickens – about 6-8 minutes. 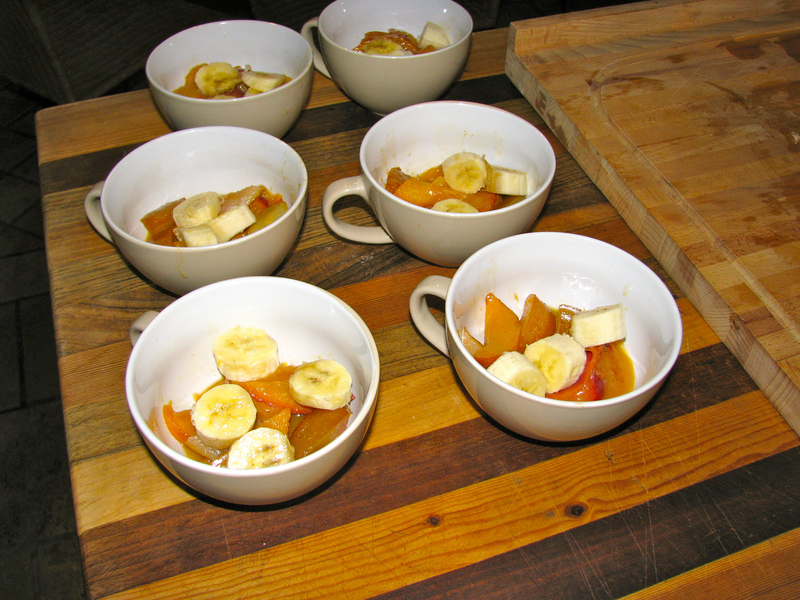 Put the fruit into serving bowls and dollop with the zabaglione. By the time we finished this wonderful meal – and a few bottles of wine – I was not thinking too clearly and, as often happens, forgot to take a picture of the finished product. Some of you need to send me one.